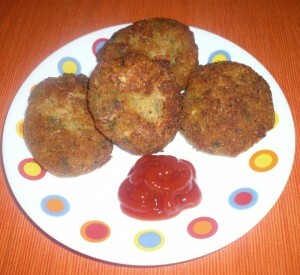 Cottage Cheese Cutlets recipe by Nazia Nazar at DesiRecipes.com. Try these crunchy golden brown cutlets, which have a soft and tender filling of cheese. Great as a starter or serve as an appetizer. Place the bread slice(s) in water just enough to soak them for about a minute. Squeeze gently between palms of hand and discard excess water. Tear into small pieces and keep aside. Mix the cottage cheese, potato (es), onion (s), green chilli (es), cornflour, chopped coriander leaves , bread pieces,salt and pepper. Shape the mixture into patties. Spread 1 teaspoon of oil on a griddle and heat on medium level for about 2 minutes. Reduce heat to low. Place 4-5 patties on the griddle and fry for 3 minutes on each side or till both the sides are golden brown. Fry the remaining patties in the same way. Serve immediately with: Green Chutney (Hari Chutney) and Tomato Ketchup.